Time: Many hours of painting, separated by several days waiting for paint to dry between painting sessions. Description: Five colorful, curvy lines coming out of a common center, along with five white lines expanding from the center. 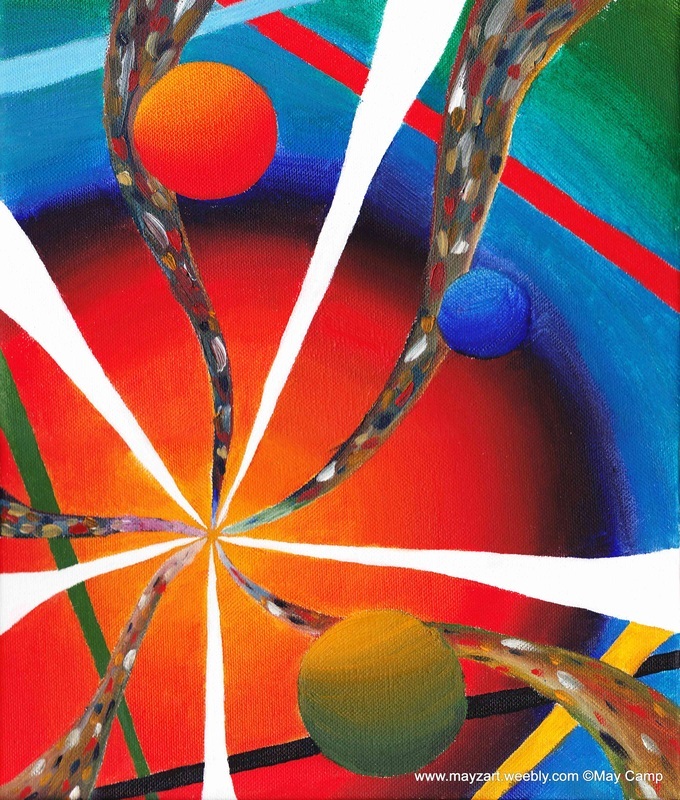 Five solid colored lines (with different colors each) randomly put across the edges of the painting, and three colorful spheres (one red-orange-yellow, another blue-light blue, and another green-yellow) of different shapes scattered about and with a bright background of circles of color starting in the common center: yellow-orange-red-purple-dark blue-light blue-green. Balls, orbs, light, shining, explosion, abstract. Artist Comments: This was the second of my four canvases that I was experimenting with in the summer of 2011. I still haven’t had that much experience with oil paints, so I was experimenting with things that were familiar, like spheres, lines, and blending colors. I realized that it is rather hard to keep blending colors to try to get the right color that you need. I went over this several times, trying to get everything with the right colors.